In Italy, a province (provincia) is an administrative division of intermediate level between a municipality (comune) and a region (regione). From 2015, the provinces were reorganized into "institutional bodies of second level", with the birth of 10 special Metropolitan cities. A further 4 such cities were added later. There are currently 103 institutional bodies of second level in Italy, including 80 active provinces, two autonomous provinces, six free municipal consortia, 14 metropolitan cities, and Aosta Valley region. Additionally, four provinces in Friuli Venezia Giulia were abolished and replaced by 18 unions of municipalities. The number of provinces in Italy has been steadily growing in recent years, as many new ones are carved out of older ones. Usually, the province's name is the same as that of its capital city. According to the 2014 reform, each province is headed by a President (or Commissioner) assisted by a legislative body, the Provincial Council, and an executive body, the Provincial Executive. President (Commissioner) and members of Council are elected together by mayors and city councilors of each municipality of the province. The Executive is chaired by the President (Commissioner) who appoint others members, called assessori. Since 2015, the President (Commissioner) and other members of the Council will not receive a salary. The South Tyrol and Trentino are autonomous provinces: unlike all other provinces they have the same legislative powers as regions and are not subordinated to the region they are part of, namely the region of Trentino-Alto Adige/Südtirol. Sardinia — following the outcome of the regional referendums of 2012 it was decreed that such institutions should be reformed or abolished by March 2013 (thus remaining in office until February 28, 2013). In January 2014 the Sardinian Regional Administrative Court declared "unconstitutional" the abolition of the Sardinian provinces, which occurred in 2013. In 2016, Sardinian provinces were reformed by Sardinia regional executive: Cagliari became a Metropolitan City; the provinces Olbia-Tempio, Ogliastra, Medio Campidano and Carbonia-Iglesias were abolished. In 2017, Regional council of Sardinia approved the institution of a new province, South Sardinia. It was formed by the municipalities of province of Cagliari that did not join to Metropolitan City of Cagliari, and those which belonged to the provinces of Medio Campidano and Carbonia Iglesias. Sicily — provinces were replaced by six Free Municipal Consortia in 2013 and three Metropolitan Cities. Friuli-Venezia Giulia — In 2016, the regional council of Friuli-Venezia Giulia approved a law which abolished the four provinces which formed the region, and replaced by 18 unions of municipalities. Metropolitan cities of Italy — In 2015, 14 metropolitan cities replaced the provinces of Bari, Bologna, Cagliari, Catania, Florence, Genoa, Messina, Milan, Naples, Palermo, Reggio Calabria, Rome, Turin, and Venice. In 1861, at the birth of the Kingdom of Italy, there were 59 provinces. However, at that time the national territory was smaller than the current one: regions of Veneto, Friuli-Venezia Giulia, Trentino-Alto Adige/Südtirol and Lazio were not included in the kingdom. In 1866, following the Third Independence War, territories of Veneto, Friuli and Mantua were annexed. There were therefore nine more provinces: Belluno, Mantua, Padua, Rovigo, Treviso, Venice, Verona, Vicenza and Udine, all previously part of the Austrian Empire. Eventually, in 1870, following the union of Rome and its province from the Papal States, the provinces rose in number to 69. After the First World War, new territories were annexed to Italy. The Province of Trento was created in 1920. Provinces of La Spezia, Trieste and Ionio in 1923. In 1924 the new provinces of Fiume, Pola, and Zara were created, increasing the total number of provinces in Italy to 76. In 1927, following a Royal charter,[Note 1] a general province rearrangement took place. 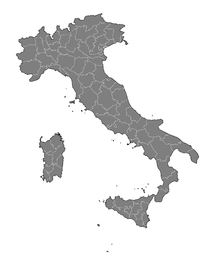 17 new provinces were created (Aosta, Vercelli, Varese, Savona, Bolzano, Gorizia, Pistoia, Pescara, Rieti, Terni, Viterbo, Frosinone, Brindisi, Matera, Ragusa, Castrogiovanni, Nuoro) and the province of Caserta was suppressed. In the same year the institution of circondari, sub-provincial wards created before the unification, was abolished. Province of Littoria (Latina) was created in 1934, and the Province of Asti in 1935. Following the annexion of Yugoslavia in 1941, the Province of Zara was enlarged and joined the Governatorate of Dalmatia (comprising the provinces of Zara, Spalato, and Cattaro), while in the occupied central part of the present-day Slovenia the new Province of Ljubljana was created. This lasted only until 1945, when Yugoslavia was recreated. In 1945, after World War II, the province of Aosta changed its name to Valle d'Aosta and Littoria to Latina; the new province of Caserta was created. With the Paris Treaties, signed on 10 February 1947, Italy lost the provinces in the regions of Istria, Carnaro and Dalmazia and part of the provinces of Trieste and Gorizia. Moreover, the province of Trieste was occupied by United States and British forces. The Italian Republic therefore had 91 provinces at its birth. The province of Ionio was renamed as Taranto in 1951, and in 1954 the province of Trieste was returned to Italy. The Province of Pordenone was created in 1968, the province of Isernia in 1970, and the Province of Oristano in 1974. In a reorganization in 1992 eight provinces were created: Verbano-Cusio-Ossola, Biella, Lecco, Lodi, Rimini, Prato, Crotone, and Vibo Valentia, while Forlì was renamed as Forlì-Cesena. Four new provinces were created in Sardinia in 2001, with effect from 2005: Olbia-Tempio, Ogliastra, Medio Campidano and Carbonia-Iglesias. In 2004 three further provinces were created: Monza and Brianza, Fermo, and Barletta-Andria-Trani, making a total of 110 provinces. In May 2012, a referendum abolished the eight provinces of Sardinia, and this suppression was to take effect on 1 March 2013. On 6 July 2012, new plans were published to reduce the number of provinces by around half. In January 2014 the Sardinian Regional Administrative Court declared "unconstitutional" the abolition of the Sardinian provinces, which occurred in 2013. Province of Aosta (Italian: Provincia di Aosta) (1927–1945). Became the Autonomous Region of Aosta Valley in 1948. Province of Terra di Lavoro (Italian: Provincia di Terra di Lavoro ) (1861–1927). Was divided into the current provinces of Frosinone, Latina and Caserta. Province of Zara (Italian: Provincia di Zara) (1923–1947). Originally a small territory, was greatly enlarged in 1941. Was a part of the Governorship of Dalmatia. It remained nominally a part of the Italian Social Republic after the Italian capitulation. Province of Pola (Italian: Provincia di Pola) (1923–1947). Created after World War I in Italian Istria. Was occupied by Germany in September 1943 and was administered as a part of the German Operational Zone of the Adriatic Littoral. Province of Carnaro (Italian: Provincia di Fiume) (1924–1947). Enlarged during World War II. Was occupied by Germany in September 1943 and was administered as a part of the German Operational Zone of the Adriatic Littoral. Province of Ljubljana (Italian: Provincia di Lubiana) (1941–1943). Was occupied by Germany in September 1943 and was administered as a part of the German Operation Zone of the Adriatic Littoral. Province of Spalato (Italian: Provincia di Spalato) (1941–1943). Was a part of the Governorship of Dalmatia. Was occupied by Germany in September 1943 and later annexed by the Independent State of Croatia. Province of Cattaro (Italian: Provincia di Cattaro) (1941–1943). Was a part of the Governorship of Dalmatia. Was occupied by Germany in September 1943 and partially annexed by the Independent State of Croatia. Province of Rhodes (Italian: Provincia di Rodi ) (1923–1947) or Italian Aegean Islands (Italian: Isole italiane dell'Egeo) . It remained nominally a part of the Italian Social Republic after the Italian capitulation. Italian Libya was divided into four provinces and one territory (Southern Military Territory or Territory of Saharan Libya). From 1939 onward the provinces were a part of metropolitan Italy. Province of Tripoli (Italian: Provincia di Tripoli) (1937–1943). Province of Misurata (Italian: Provincia di Misurata) (1937–1943). Province of Benghazi (Italian: Provincia di Bengasi) (1937–1943). Province of Derna (Italian: Provincia di Derna) (1937–1943). Province of the Western Alps (Italian: Provincia delle Alpi Occidentali). Planned World War II province to be created of the annexed French territories of the Alpes Maritimes (including the Principality of Monaco) and parts of Alpes-de-Haute-Provence, Hautes Alpes and Savoie. The town of Briançon (Italian: Brianzone) was to act as the provincial capital. Province of Ragusa in Dalmatia (Italian: Provincia di Ragusa di Dalmazia). Planned World War II province to be created of the annexed Dalmatian territories that were areas of the ancient Republic of Ragusa. Provinces in islands of Greece: Provincia delle Ionie; Provincia delle Cicladi; Provincia di Samo. Planned World War II provinces to be created of the Italian-annexed islands of Greece. Italian Provinces, according to the reform proposed by Mario Monti's Government (the map does not include the updates of abolition of the provinces in Regions of Sicily and Sardinia). Provinces are often deemed useless, and many proposals have been made in recent years to eliminate them. However, the difficulty of changing a constitutional law and the opposition of some groups and politicians halted any reform proposal. During his speech to the Chamber of Deputies, newly appointed Prime Minister Enrico Letta announced that a revision of the second part of the Italian Constitution is needed, in order to change the current bicameral parliamentary system and to abolish provinces. The proposal was rejected in the constitutional referendum held in 2016. ^ Regio Decreto Legislativo n. 1/1927, 3 January 1927, "Riordinamento delle circoscrizioni provinciali"
^ "Addio alle vecchie province, è legge il Ddl Delrio". Ilsole24ore.it. 2014-04-03. Retrieved 2014-08-15. ^ "Le elezioni". Dipartimento per gli affari interni e territoriali. ^ "Province, inizia il conto alla rovescia Gli enti scompariranno a febbraio 2013 - Cronache dalla Sardegna - L'Unione Sarda". Unionesarda.it. 2001-08-17. Retrieved 2013-02-04. ^ "Riordino province, incostituzionale secondo il TAR Sardegna". Giurdanella.it. 2014-01-10. Retrieved 2014-08-15. ^ "Enti locali: approvato nuovo assetto territoriale e nominati amministratori straordinari". Autonomous Region of Sardinia. 2016-04-20. ^ "Carbonia diventa capoluogo della provincia del Sud Sardegna". La Nuova Sardegna. 2016-06-01. ^ Redazione Online. "Spending review, province ridotte del 50% Patroni Griffi:«L'accorpamento è una svolta". Corriere.it. Retrieved 2013-02-04. ^ a b Davide Rodogno (2006). Fascism's European empire: Italian occupation during the Second World War. Cambridge University Press. pp. 89–92. ISBN 0-521-84515-7. ^ "Lombardo contro le Province "È giunto il momento di abolirle"". la Repubblica. 26 July 2011. Retrieved 21 November 2011. ^ "Pareggio di bilancio in Costituzione dal 2014 Addio Province (escluse Trento e Bolzano)". la Repubblica. 8 September 2011. Retrieved 21 November 2011. ^ "Più di un milione di persone a libro paga della Politica Spa". la Repubblica. 18 July 2011. Retrieved 21 November 2011. ^ "Il presidente della Provincia di Varese "Via le Regioni come Molise e Umbria"". la Repubblica. 16 July 2011. Retrieved 21 November 2011. ^ Fabrizzi, Federica. "LA PROVINCIA: STORIA ISTITUZIONALE DELL'ENTE LOCALE PIÙ DISCUSSO". federalismi.it. Retrieved 21 November 2011.